Here at Kuhn Construction, we pride ourselves on offering high-quality and affordable home remodeling services for our customers throughout Islip, Brookhaven, Smithtown, and nearby in New York. Below, we have outlined exactly what you can expect from our design process when you get started on your kitchen, bathroom, or other home remodeling project. We always work closely with homeowners to ensure that the final result matches your vision. 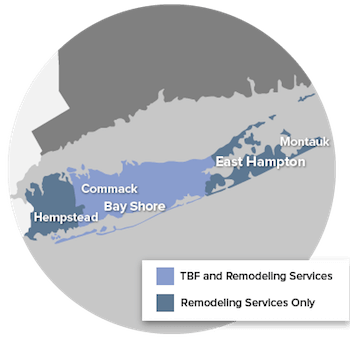 Contact us today to learn more about our design and build services in Suffolk & Nassau County or to schedule your free estimate! Read through and execute Design Retainer Agreement (required fee for Design Retainer Agreement is 2% of low end of the estiamted budget or minimum of $5000). Schedule a time to meet and review Phase 1 design concepts at Kuhn Construction offices in Islip. Review the designs/concepts and alternatives we have created for you and make corrections/revisions. Schedule a meeting to review revised design concept, if necessary (note: the initial Design Retainer Agreemetn includes up to two revised design concepts). Discuss and execute Final Design Development Agreement (required fee for Final Design Development Agreement is 6% of low end of the estimated budget). Prepare a shopping list (what we call our "Customer Selection Sheet") for you of all items that need to be selected. Guide you through the Selection Process using our Selection Room, samples, pictures, and previous projects, and you choose what you like and want. Guide you through the forms and styles available for each item. Help you decide on appropriate colors. Get color copies and samples of the items you've selected. Keep track of all selections made so that as we review each area of design you can be assured that your theme is consistent and that we are creating the picture that you want. Have our production department review your plans and visit your home to confirm buildability. Gather quotations from all vendors for the selected materials. Review Final Contract and Payment Schedule. Make small revisions (if necessary). Have you approve a construction agreement which allows us to start the next phase of your project. Prepare the construction packet for your Project Manager. Introduce you to your Project Manager. Review the project on-site with your PM. Ask a series of questions regarding general "housekeeping" issues to ensure your safety and security during construction. Update you on changes to the schedule using our online Project Management software. Utilize our detailed checklist during each phase of construction to ensure that your project is complete with accuracy and to a high level of quality. Our goal is to make the process an enjoyable experience for you. We want you to love the enhancements to your home and share your experience with others who would benefit from our services. If you're ready to get started on your kitchen remodeling, bathroom remodeling, or other home remodeling project in New York, don't hesitate to contact the remodeling experts at Kuhn Construction today! We offer free, no-obligation estimates throughout Suffolk & Nassau County.